The Marimaca Project in northern Chile. Source: Coro Mining Corp.
Coro Mining Corp. [COP-TSX] shares were active Tuesday April 9 after the company released an update from its Marimaca copper project in Chile and said it has appointed a new chief financial officer to replace Armando Veliz. Coro shares advanced on the news, rising 5% or $0.005 to 10.5 cents on volume of 886,600. The shares trade in a 52-week range of $0.045 and 12 cents. Coro has said it is deploying a strategy that involves finding, developing, and putting into production high return/low cap-ex copper deposits located in Chile. “Our preference is for open pit, heap leach copper projects,” the company has said. It has been focusing on achieving production from its Nora Solvent Exchange Electrowinning (SXEW) plant, which is 65% owned by Coro and 35% by ProPipe SA., a Chilean engineering company. Coro previously said the plant was key to the rapid development of its Berta Copper Deposit. That’s because it bought the plant to process Pregnant Leach Solution from the Berta deposit, which has a measured and indicated resource of 17.6 million tonnes of 0.37% copper. 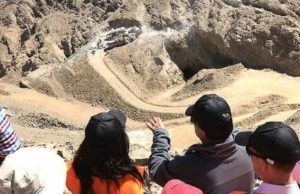 However, Coro recently sold the Berta mining operations to a private Chilean company for US$8.5 million, a move that allows Coro to focus on Marimaca. The Marimaca Project is located in the Antofagasta region of northern Chile, within 25 km of key infrastructure, including power, water, roads and railways. The company said Marimaca has the potential to be one of the best new open-pittable copper oxide deposits in Chile. The project is divided into a number of different areas known as Atahualpa, Tarso, La Atomica, and Marimaca 1-23, where a measured and indicated resource of 303,698 tonnes of contained copper has already been established. The initial discovery at Marimaca 1-23 was made by Sergio Rivera, Coro’s vice-president, exploration. A fully funded Phase 11 exploration program is currently underway, targeting an enlarged resource in the third quarter of 2019. On Tuesday, the company said a third batch of 17 reverse circulation holes (3,650 metres) has been completed at the Atahualpa area, bringing the total to 57 holes (16,050 metres). The company said new drill results confirmed a further extension of copper oxide mineralization from the previously announced Atahualpa drill results, over 300 metres to the north, resulting so far in an approximate 600-metre extension of mineralization from the Marimaca 1-23 area. In addition, the results also confirmed massive parallel fracturing control mineralization at Atahualpa with better grades and thicknesses than anticipated. Highlights include Hole ATR-41, which returned 48 metres of copper oxide and enriched mineralization averaging 0.64% copper from 46 to 94 metres. Meanwhile, Coro said Leonardo Araya Munoz is the new CFO. He is a Chilean public accountant and commercial engineer from the University of Santiago. The company said Armando Veliz has decided to leave the company at the end of this month to return to Argentina, where he has been offered a leading role with a major gold producer.